Steve Lomas believes his St Johnstone side finally got the reward for their early-season performances in the 2-1 win against Celtic. Saints had posted only two points before coming from behind to beat the reigning Scottish Premier League champions at McDiarmid Park. "It was a reward for a lot of good performances and not a lot of results in the first five games," said Lomas. "I was pleased for the boys, they put an awful lot into it." Kris Commons drilled home an early opener for Celtic but Gregory Tade soon levelled. St Johnstone survived calls for a penalty following Steven Anderson's challenge on Commons and Lomas admitted: "I think that's a free-kick any other area of the pitch but I'm not going to comment on referees." 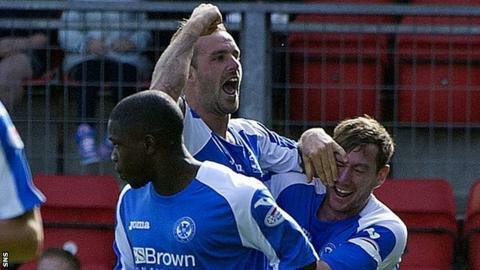 Rowan Vine netted his first goal for the Perth side 10 minutes from the end and the curling strike proved to be the winner. "The quality of the finish from Viney at the end was exceptional," added Lomas. "Thoroughly delighted, our boys were superb. "I'm a big believer that performances normally take care of results but probably for four out of the first five games, it didn't do that. "It's pretty hard when you keep telling the lads that they're performing well and that they've got to keep believing. "The most pleasing thing was, 1-0 down, it showed what our character, our team was all about and that can never be in doubt."